If you’re a vegetarian person or trying to maintain a healthy diet devoid or less of red meat you can try what I’m doing for my meals. If you want to mix something to vegetables to make it more delicious without meat try adding breaded tofu instead of meat. You’ll only dip tofu squares to little soy sauce, roll in breading then fry. This way you’ll enjoy veggies without the meat ingredients but with a taste that’s almost equal. 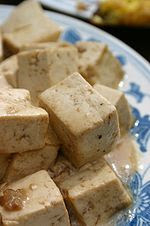 Tofu or bean curd is very healthy too because they are made from soy milk. It’s a good source of protein and low in calories, perfect for dieters like me. It has also a good amount of iron, calcium and magnesium and best of all it contains little fat. For me it’s a wonder food and seeing its nutrient contents I’ve collected and experimented on several tofu recipes.